Ridgid designed this ONESTOP wrench to be the only wrench you need to install angle and straight stops, faucet nuts, washer/dryer/dishwasher legs, compression couplings, and other fittings. Actually, it’s two separate wrenches — the flare-style wrench stores in the open-end handle. OK, so this is just another plumbing wrench, but what I thought was really cool was the stepped open end jaw. The jaw fits two different-sized fasteners — if you made an entire set like this you’d only need half the number of wrenches. It might not be ideal for every day use, but there are plenty of applications where size and weight are critical. 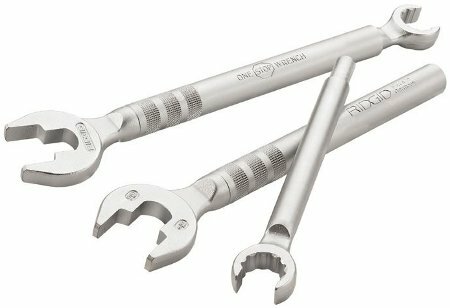 The ONESTOP wrench will cost you a little over $30 shipped. They don’t list it online, but I’ve also seen it on shelves at Home Depot. Whenever I see these at Home Depot, I’m always tempted to pick up a set. So far I’ve been resisiting 😉 It’s just that I have so many Craftsman wrenches. don’t waste your money, it works about 50%of the time. You should already have two wrenches in your tool box anyway’s, they work just as good. Thats what I was thinking. I was going to pick up the angle stop wrench that screws into the out going water supply of the angle stop, it fits 1/2 ” and 3/8 ”/ what do you think? So you have tried this one stop wrench?? thanks.